Well, Blaise started toddling and now you'll never hear from us again. We spend the day chasing her and when she finally goes to bed, we spend the evening undoing the damage. She has begun using words for absent objects (e.g., to request some apple or a bottle), which is a giant communicative step. Unfortunately, the dozen or so words she has all sound a lot a like if you're not listening carefully and she doesn't tend to repeat herself, so we keep making bottles when she wants apples and looking at pictures of Dada when she wants a bottle. In new food adventures, she appears to tolerate eggs, even though she doesn't like them much. This let's us move safely outside the vegan realm. Someday we might be brave enough to try chicken again. If you're in Boston or surrounding and would like to join us, you can go here to register. Click the "Join this Team" link on the right side of the page. We're doing the 2-mile walk. Did you hear that? Yeah...that was the sound of our sanity cackling as it ran off into the night. The cat has already posted an ad on craigslist. Serious inquiries only. It's very much spring here, which is kind of weird. Boston is not known for its springs. They're usually pretty gray and chilly, but for some reason the past few weeks have been sunny and pleasant. I'm all for it (even though it's probably a sign of undesirable climate change) because Blaise has been impossible to keep inside lately. She literally crawls to the front door and bangs on it. The nice weather means plenty of time for Blaise's favorite hobbies: walks and swings. She takes a walk (holding onto someone's hand) to the end of our block at least once a day. It's a long block; her therapist was very impressed. Lately, we've been turning onto Mass Ave at the corner and walking a little more. Blaise loves Mass Ave because it is full of people who smile at her and have friendly dogs. On our way down the block, she likes to touch all of the dandelions. There are a lot of dandelions, so it takes us a while. The big new on the walking front is that Blaise took her first real unsupported steps this morning! She took a couple of unsupported steps a few months ago, but those were uncontrolled and accidental. This morning she was steady and deliberate for two steps and then grabbed a chair. She lacks confidence in her ability to walk, but that will come and once it does, we'll be even crazier than we are now. Related to our craziness, we've begun looking for a proper daycare solution for Blaise. Except for a brief period with a somewhat irregular daytime sitter, Ben and I have been playing baby catch during the day for almost 11 months now. It's exhausting and leaves both of us feeling like we're not really spending any time or energy anywhere. It's also time for Blaise to spend more time with other kids. We're a little apprehensive, as I think any parent is when it comes to relinquishing care of their child to someone else, but we'll find a good situation for all of us. Apologies for the lack of photos. Our somewhat lackadaisical babyproofing makes it hard to take pictures now that Blaise is very mobile. Also, ever her mother's daughter, she tends to either run off or try to grab the camera whenever we get it out. In all of the craziness surrounding the decision to go to North Dakota, we neglected to mention other fun things that have been going on in our house. My mom (a.k.a., Gran) came for a few days last week. She and Blaise had tons of fun while Ben and I both went to work, which was very exciting for everyone. Blaise is eating like crazy (24-28 oz of formula a day and three or more meals and snacks) and I think she's grown another half inch. Her weight-for-length is on the low side, so pants long enough for her are huge through the waist. That, I guess, is what the nice bulky cloth diapers are for: holding her pants up. Otherwise, we'd have to resort to suspenders. Blaise's supported walking is progressing nicely. She can walk the full length of our block and back holding onto our hands. More fun than walking, though, is dancing. She does some planned hand gestures to a few songs, including 6 Little Ducks, Itsy Bitsy Spider and Single Ladies. ("Put your hands up!") More fun that that, though, is freestyle boogying. The past week or so has been a lot of fun for Blaise, what with many exciting visitors, trips to the playground and various restaurants, and nicer weather that increases the likelihood of seeing dogs when we're out for a walk. It's also brought some exciting job-related news that we're very excited to share with you, our faithful blog readers. 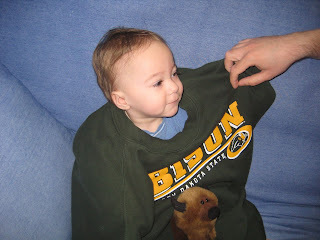 OK, the sweatshirt is kind of folded, so it's not the best for communicating what's up: Erin and I have just accepted faculty jobs at North Dakota State University! We'll be in Boston for a little while longer, but this means that soon we're moving on to Fargo to build a home (and two labs) where the buffalo roam (OK, technically ND is where the bison roam, but I don't know any songs that involve bison). So...a big move and a big change for all of us, but also a lot of exciting things on the horizon. We'll probably write more about Fargo and NDSU as we get closer to the actual move, but for now we mostly wanted to share the news with you all. A year ago yesterday, Blaise had abdominal surgery to take down the ostomy she was given immediately after her birth and re-connect her small intestine to her large intestine. Big day. Biggest day I ever had. What we found out that day was and continues to be wonderful. Blaise’s prognosis changed from dire to excellent in the space of about 8 hours. As those of you who follow the blog know, the year since the surgery has brought a series of milestones that we believed we might never reach. An infant who was potentially unable to eat is now a toddler who eats Cheerios by the handful and eyes chicken parmesan with the look of a predator. Blaise has grown bigger and stronger, learned to crawl, take steps, and dance, and knows the names of at least a dozen or so stuffed animals to say nothing of all the books and other toys she can identify when asked. It’s a pretty great story, and it’s hard not to replay some of its more dramatic moments now that the seasons have turned back to where they were a year ago. A lot of things are the same: the weather is beginning to get nicer, some of the same friends have visited. Of course, for all those similarities, everything is different now. A good friend of ours asked me a question a few days ago that I think nobody else has asked: “Do you think you realize what happened?” This is a very good question and doesn’t have an easy answer. I certainly don’t feel like I was in denial about the severity of Blaise’s condition at birth and Erin and I have always made sure we understood the choices we had to make. We read about kids who had numbers that looked like Blaise’s, we talked to as many parents as we could, and I frequently wore the CHB badge that said “Ben Balas, PhD” when I thought it would get us more or different information. We learned all we could about what we were facing and tried to prepare as best we could. 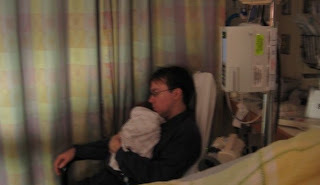 The night before her surgery, we talked about what we thought might happen and I had decided that the most likely thing was that Blaise would have an ileo-cecal valve on her large intestine, but that we’d not be able to keep it due to the absence of more small intestine. I forget what Erin’s guess was, but my point is that we weren’t being overly optimistic…we felt like we understood the odds and understood what was at stake and were trying to stay rational about the outcome. Still…with all that preparation, all the studying GI textbooks and reading short-bowel blogs, do I actually realize what happened this time last year? Sometimes I think I do. I catch myself watching Blaise eat or drink from a cup and think that these were the things that may not have been possible had things gone differently at various points. Something catches in the mind and a combination of relief and fear hits. Relief because we’re where we are, and fear because it could so easily have been different. It’s the last part of that sentence that makes me believe that ultimately I don’t realize what happened. Not really. Things could have been different, and I have no way of understanding what that would have been like. One of our biggest pet peeves is how many people try and tell us that they know how hard parts of the past 15 months have been. They don’t. They can’t. Likewise, I can’t pretend that I know what it would have been like to care for Blaise under different circumstances. Part of realizing what happened when you dodged a bullet is knowing what it would have been like to be hit. This I lack, and this I am comfortable with. There’s a word many people use when they talk with us about Blaise, and about her surgery last year in particular. I dislike this word for a variety of reasons. First and foremost, I feel like it obscures more than it reveals. Second, I also think it fails to give credit where credit is due. For all I don’t think I fully grasp what happened last year, I do think I learned some things from it, and it’s these facts that I think matter more than anything else: My daughter is an amazing person, as are the surgeons, doctors, and nurses who have taken care of her. A year and a day later, thanks again to all of you who spent April 6th checking the blog for updates 12 months ago. It meant a lot, and we’re still so glad we had good news. I think there's a lot to be said for social pressure of various kinds. Peer pressure is often talked about in a negative way, but it can be very positive. You just need excellent peers and it's a great thing. We're very lucky to have some fantastic peers for Blaise. We had three friends have babies within a couple weeks of Blaise being born, several friends have had babies since and we've made new friends with kids close to Blaise's age over the last year. I've been noticing lately that she seems to pick things up from them much more quickly than she does from us: going to the playground with Auden made her more motivated to try supported walking, some time with her friend Leo introduced a new sign to her vocabulary and a wonderful week of fun with our French visitors has Blaise much more willing to take a little food from a spoon again and a bit more outgoing with her walking. Who cares that Mom and Dad can walk, sign, talk and eat? When another toddler does it, it's much more relevant. We saw Mathieu, Julie and little Erin off last night. The time always flies when we're with them and we'll have to work out a way to spend more time on the same continent soon. Blaise and Erin were fast friends: bisous, "sharing" toys and gleefully pointing at dogs. Photos are here. Blaise's weight, that is. From 17 lbs, 11 oz at her clinic visit 3 weeks ago to 18 lbs, 5 oz at the pediatrician this morning. Her ped's scale always comes in a little heavier than the one at clinic, but that's still well over half a pound in 3 weeks. Two of those weeks were tube-free. Grow, Blaise, grow! Cute pictures of Blaise with her friend Erin are forthcoming.